September 2013: "For more than a decade, Anderson was supposed to have been in a Missouri prison cell. Instead, through some kind of massive procedural screwup, he was out walking among us. Finding him would have been a trivially easy task for police: He was possibly the worst fugitive of all time. He didn't change his name. He didn't leave town. In fact, his address is just two blocks away from the last one the court system had for him. It is where he built his house from the ground up — the home with the granite countertops and the trampoline out back. He registered his contracting business with the secretary of state to that address." June 2013: "The fact that Illinois and Missouri's prisons have become a farm team of sorts for Forest Park only explains part of the reason why the crowd here — sometimes 30 or 40 deep, drinking beers, smoking, shelling peanuts between games — stands out compared to the preppy joggers trotting past. Beyond the former inmates, the courts have always attracted an eclectic mix: restaurateurs, doctors, lawyers, Imo's delivery drivers, construction workers, entrepreneurs, prison guards and the unemployed. Forest Park even (very occasionally) lures the man some consider the greatest handballer to ever live, St. Louis' own David Chapman. Three decades ago the handball community in Forest Park was forever changed when one of its own was gunned down as he left the courts. Today the man's killer is a frequent visitor to the Forest Park courts, though he hides his identity from the handball players who continue to tell the story of the 1979 murder in almost mythic terms. But more on that later." 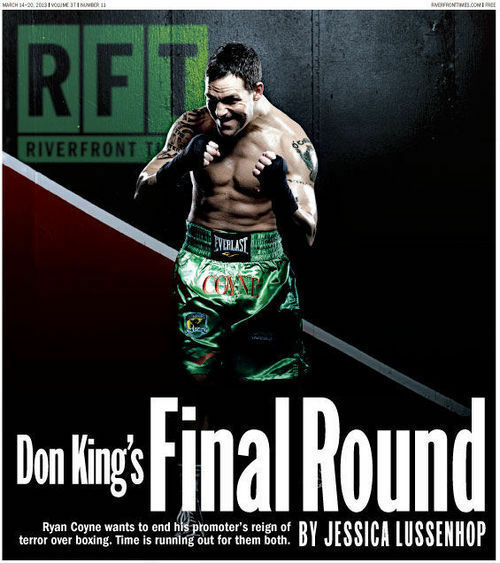 March 2013: "Instead of battling for the title in the ring with his fists and wits — the way a boxing narrative is supposed to go — Coyne got knocked out with high-priced attorneys and threatening letters. Most bizarre, the person Coyne blames for the fiasco should have literally been in Coyne's corner: his promoter, the legendary Don King. Now Coyne finds himself going toe-to-toe with King in court, and he's finding the octogenarian boxing chieftain to be his most vexing opponent to date. 'It's sad to say,' says Moorer, Coyne's former trainer. 'But that's how boxing is with Don King involved.'" May 2013: "The consequences of Vinita Park's fraught race relations are costing the town more than goodwill. Earlier this year city attorneys approved a settlement for hundreds of thousands of dollars to five former white police officers who claim they were fired so African Americans could fill their positions. The former chief of police and director of public works, both white, have sued, leveling similar allegations. A sixth white former officer sued earlier this month. 'They're just trying to destroy the administration, by me being the first black mayor,' McGee says." February 2013: "In an off-election year the deal may not have made a ripple. But in the fevered climate of campaign season, a wonky municipal matter has swelled into a politically charged fiasco. On one side of the debate over the contract is the Slay administration, which says the water division needs retooling to prevent some of the fiscal nightmares that are looming on the utility's horizon. On the other side are a hodgepodge of critics including Slay's political adversaries (most notably his mayoral challenger, Lewis Reed), employees of the water division, environmentalists and even the St. Louis Palestine Solidarity Committee. In the eyes of these detractors, Veolia is the last company on Earth that should oversee one of St. Louis' most prized assets." And read about the ultimate fate of the controversial contract here, a year after we broke the story. February 2012: "The numbers were astounding: One hundred and four officers in 18 different agencies from around the state had accessed her driver's license record 425 times in what could be one of the largest private data breaches by law enforcement in history. The agencies involved have maintained that this is an isolated incident. But one officer, who would not use his name for fear of further discipline, says that the practice is commonplace. 'I get Anne's side of it,' he says. 'But every single cop in the state has done this. Chiefs on down.'" Written in black permanent marker in the margin of the envelope was the reporter's name: mine." February 2011: "Today, tens of thousands of temporary scorers are employed to correct essay questions. This year, Maple Grove-based Data Recognition Corporation will take on 4,000 temporary scorers, Questar Assessment will hire 1,000, and Pearson will take on thousands more. 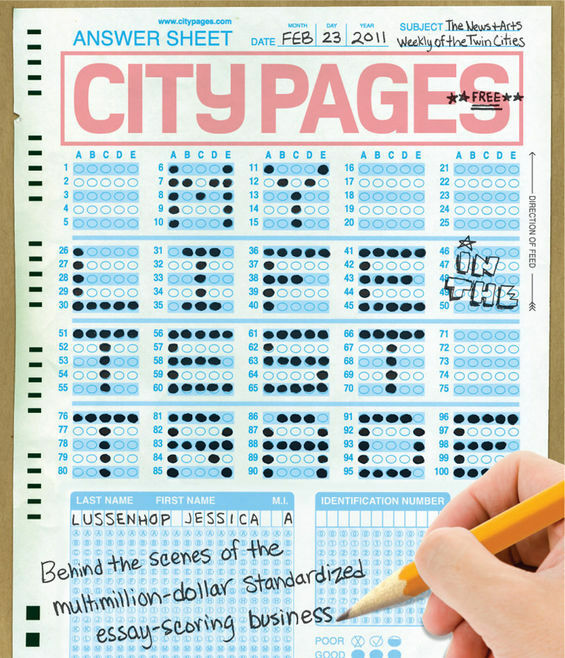 From March through May, hundreds of thousands of standardized test essays will pour into the Twin Cities to be scored by summer." January 2011: "Don Rawitsch rolled out a four-foot-long piece of white butcher paper on the living room floor of his Crystal apartment. He glanced at an open map of the United States frontier from the 1800s. Then he traced a squiggly line from the right side of the paper to the left. By the time his roommates Bill Heinemann and Paul Dillenberger returned home, the line had become a series of squares leading across a map of the western U.S. Rawitsch was scratching out words on a stack of cards. 'Broken wagon wheel,' said one. 'Snakebite,' said another. He called it 'Oregon Trail.'"